I'm so happy with how our new entry way in functioning. Before the boys would take off their jackets and drop them on the floor because they couldn't reach the hangers in the coat closet and nor can my 2 1/2 year old put his jacket on a hanger. So I figured out this solution of hooks, but not just any ol' hooks, each hook is for a particular person. Kinda like assigned seating for our jackets. 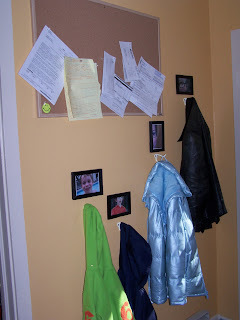 I framed a picture of each family member above their hook and the cork board above everything is perfect for catching important mail as we walk through the door. For me the key to organizing and decorating is figuring out how you live in a space and work around that. Do I enjoy looking at our jackets on the wall from my living room? No, not really. But it's better than seeing a pile of little boy jackets right by the front door. Breakfast bars regular or gluten free?